Below is a video that is less than 4 minutes long detailing the facts and benefits of our 3M Window Films and Glass Tinting. Whether it be for home or office, Window Film has a variety of uses, ranging from UV and heat protection, safeguarding inhabitants and belongings from unwanted entry or smash-and-grab crime, decorative and frosted designs, anti-graffiti, weather and bomb-blast protection, and more. See how your window film installation may qualify you for tax credits on your next income tax return. 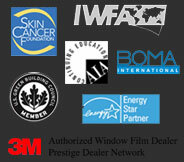 Our window films are LEED certified and are recognized for efforts towards sustainable design. We provide as much information on our window films as possible, including sample sheets with technical information, specifications and benchmarks, and sample warranties. We understand that sometimes the technical terms can be a little confusing, or that our clients may want to learn a little more about the product before getting in touch. We believe in informed decisions. In this section, we provide answers to many of our frequently asked questions, in regards to both window film installation and our company itself.